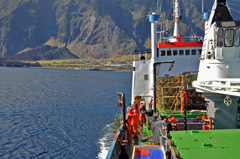 News of commercial and domestic fishing in the waters of the Tristan da Cunha archipelago during the 2011-2012 fishing season. As winter approaches the Tristan Islanders prepare for the winter storms by bringing up all the fishing boats from the harbour side, both for safety reasons (as high seas often engulf the harbour breakwaters and adjacent areas) and to do maintenance ready for the start of the new season which starts on the 1st July. 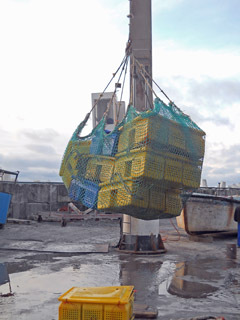 All quotas at the Tristan group had been completed, however Island fishermen were unable to land the Tristan TAC of 174 tonnes before the 30th April, when they prefer to stop, and give the lobster time to re-group. Another reason is to leave the female 'berry animals' time to release their eggs without any disturbance, and this is why Islanders only fish in daylight. Overall 150 tonnes of the Tristan TAC was landed by shore-based Tristan Islanders and 24 tonnes by MV Edinburgh. Fishing has been poor after the bumper month in November reported below. There were no days in December due to a combination of weather and a freight project taking preference over fishing. We had six days in January, four in February and only one so far in March and the weather looks unsuitable for the next week at least - all very frustrating! The Edinburgh came and helped by catching 13.8 tonnes and we now only have 18 tonnes left to go. At the recent average of app 2 tonnes per day we are just waiting for the unseasonal continued Northerly winds to give us a break so we can mop up the remaining balance. What a month! We have been hoping for a spell of fishing that would let us test the factory running at high volumes. I am happy to say that we all made it through the month without major mishap and fishermen, factory staff and processors all pulled their weight to get us through a very busy month. A big thank you for all the food dropped off at my house in the afternoons, meaning I didn't have to cook when I got home at the end of what were mostly very long days. The month started with a fishing day on the 3rd and then ended with one on the 30th. With the days in between we had a total of 13 fishing days. The daily landings dropped off as the month progressed from 5 and 6 tonnes a day to app 3.5 tonnes, but those are certainly not figures to cry about. In all 62 tonnes were landed at a daily average of 4760 kg. In the middle of the month we had an uninterrupted sequence of 7 days with just under 38 tonnes being landed. Looking back over the previous two seasons it becomes clear that we are well ahead in terms of quota still left in the water. 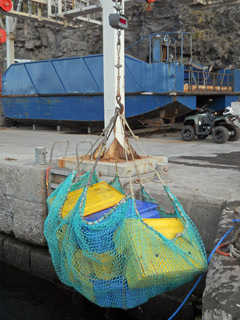 At the end of November 2009 we had only landed 61.9 tonnes on 14 fishing days. Last year we had landed 102 tonnes on 31 days, while this year we have only had 26 days, but are sitting with a landed total of 114.5 tonnes. This is a nice position to be in and we hope it continues. December will be a little disrupted due to operations with both Baltic Trader and Edinburgh - needed to bring further harbour repair equipment and materials, the island Christmas cargo, refilling our holding tanks with diesel and removing all the frozen product from our (nearly) full cold store for shipment to the various customers. This means we will probably not be able to utilise all available fishing days in December, but we are still hoping to land a couple more tonnes before the Island shuts down for the festive season. Let's hope I have similarly good news for you at the end of December. The 43-member Edinburgh crew were presented with the award following their remarkable efforts in rescuing the crew of the stricken bulk carrier MS Oliva wrecked off Nightingale Island in March 2011 and subsequent help with the clear-up operation. This despite the fact that they faced a reduced pay package as their fishing for crayfish, for which they are paid commission, was curtailed. 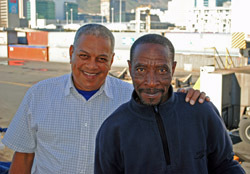 Captain Clarence October (left) and powerboat coxswain Thembinkosi (Enos) Hlongwane (right) who received special mention for his role in the Oliva crew's rescue. Clarence Hendry October has been involved in the Tristan lobster fishery since Premier Fishing took over the Lobster Concession in 1997. 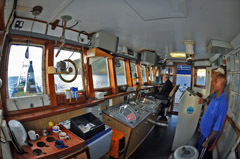 He was promoted from 1st Mate to Captain of the MV Edinburgh in October 2000. Unfortunately Clarence was not present at the presentation due to a prior commitment. Tristan Administrator Sean Burns boarded MV Edinburgh when the ship arrived at Tristan da Cunha on 10th November for the second 2011/12 extended fishing trip around the outer islands of Gough and Inaccessible. He congratulated Captain Clarence and his crew on their achievement and presented them with a gift on behalf of the island. an acknowledgement letter and gift. 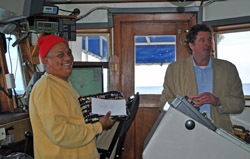 'We were delighted to deliver messages of congratulation to Captain Clarence and his crew for the SAMSA Seafarer of the Year Award 2011. October got off to a late start, but eventually produced five very good days. An average of 5.6 tonnes per day saw a total landing of 28.3 tonnes. The weather has still not turned too hot so we are able to keep high volumes live for processing. We expect this to start becoming more of a problem towards the middle or end of November. Thursday 3rd was our first fishing day for November and another landing of 6 tonnes means we are off to a good start. Due to bad weather at Tristan, the lobster factory is some 24.72 tonnes behind the catch this time last year. On the last fishing day, the nine inshore boats landed 5.7 tonnes, but since then the weather has not given the fishermen a chance to get out. Since the opening of the season in July there has only been 10 fishing days compared with 19 days in the same period last year. Fishing at Gough Island by MV Edinburgh has been good with 5.,526 tonnes, of the 95 tonnes Total Annual Catch (TAC) being landed to date. The Island Council met on 18th October to consider MARAM’s September report of scientific advice on the effect of the oil and soya spill from the MS Oliva on the fisheries at Inaccessible and Nightingale Islands. They also considered the recommendations arising out of the report. In the absence of any further advice, the Island Council decided to accept MARAM’s recommendations to reduce the TAC for the 2011/12 season on Inaccessible from 95 to 53 tonnes and to keep the fishery on Nightingale closed pending the results of further test fishing, sampling and further studies. At present 19.178 tonnes has been caught at Inaccessible, leaving a balance of 33.822 tonnes to catch. Therefore to date there is an outstanding balance of 209.7 tonnes to be caught between all islands for the 2011/12 season. temperatures mean that the lobster arrive in stronger than usual condition and we are able to keep large numbers alive in the tanks to process into higher value product on the days following landing. We are producing a new Sashimi grade product for Japan using a tightly controlled production process which places very high emphasis on rapid temperature reduction. The criteria are even higher than on our current raw and cooked products and production staff are coping well with the addition of these small, specialised batches. We are also packing a trial order of 10 kg units of lobster heads for the first time. The crayfish heads left after tailing are traditionally crushed and returned to the sea or used locally to fertilise the gardens so it is good to have a better use for this very enjoyable by product. Administrator Sean Burns confirmed on 23rd September that the Nightingale fishery remains closed until further notice. Inaccessible is open but with an initial quota pending advice from experts on what the quota should be after the MS Oliva wreck. 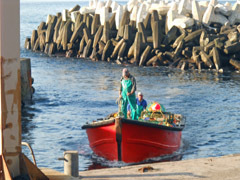 MV Edinburgh left Cape Town for its first extended fishing trip on Saturday 20th August. After unloading at Tristan the ship will head for the outer island fishing grounds. The Nightingale Island fishery remains closed pending tests on water and fish quality following the wreck of MS Oliva in March 2011. So MV Edinburgh will concentrate on fishing Gough and Inaccessible islands pending the Nightingale fishery re-opening. set out from Calshot Harbour. and the Ovenstone factory fishing vessel MV Edinburgh fishes the outer islands. 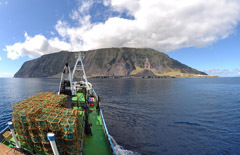 The Tristan da Cunha Fishery gained the prestigious Marine Stewardship Council award for its well-organised and sustainable fishery in June 2011 which will be valid until June 2016 when there will be a re-assessment. We have a separate page devoted to details of this award, the July 2011 Cape Town ceremony when the certificate was presented, and background to the training which has taken place. 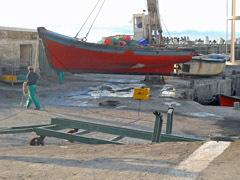 The end of the 2010/11 fishing season was dominated by the consequences of the disastrous wreck on MS Oliva in march. We created a separate MS Oliva Fishing Page which monitored developments as they unfolded.